Luca Pacioli was born between 1446 and 1448 in Sansepolcro (Tuscany) where he received an abbaco education. This was education in the vernacular (i.e., the local tongue) rather than Latin and focused on the knowledge required of merchants. His father was Bartolomeo Pacioli, however Luca Pacioli was said to have lived with the Befolci family as a child in his birth town Sansepolcro. He moved to Venice around 1464, where he continued his own education while working as a tutor to the three sons of a merchant. It was during this period that he wrote his first book, a treatise on arithmetic for the boys he was tutoring. Between 1472 and 1475, he became a Franciscan friar. In 1475, he started teaching in Perugia, first as a private teacher, from 1477 holding the first chair in mathematics. He wrote a comprehensive textbook in the vernacular for his students. He continued to work as a private tutor of mathematics and was, in fact, instructed to stop teaching at this level in Sansepolcro in 1491. In 1494, his first book to be printed, Summa de arithmetica, geometria. Proportioni et proportionalita, was published in Venice. In 1497, he accepted an invitation from Duke Ludovico Sforza to work in Milan. There he met, taught mathematics to, collaborated and lived with Leonardo da Vinci. In 1499, Pacioli and Leonardo were forced to flee Milan when Louis XII of France seized the city and drove out their patron. Their paths appear to have finally separated around 1506. Pacioli died at about the age of 70 in 1517, most likely in Sansepolcro where it is thought that he had spent much of his final years. 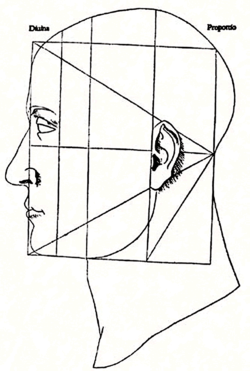 Woodcut from De divina proportione illustrating the proportions of the human face. Note that the lines or rectangles drawn do not correspond to the golden ratio; this is from the second part of the book, covering the Vitruvian system. Tractatus mathematicus ad discipulos perusinos (Ms. Vatican Library, Lat. 3129), a nearly 600-page textbook dedicated to his students at the University of Perugia where Pacioli taught from 1477 to 1480. The manuscript was written between December 1477 and 29 April 1478. It contains 16 sections on merchant arithmetic, such as barter, exchange, profit, mixing metals, and algebra. One part of 25 pages is missing from the chapter on algebra. A modern transcription has been published by Calzoni and Cavazzoni (1996) along with a partial translation of the chapter on partitioning problems (Heeffer, 2010). 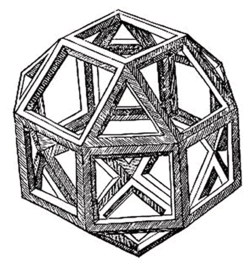 Summa de arithmetica, geometria. Proportioni et proportionalita (Venice 1494), a textbook for use in the schools of Northern Italy. It was a synthesis of the mathematical knowledge of his time and contained the first printed work on algebra written in the vernacular (i.e., the spoken language of the day). 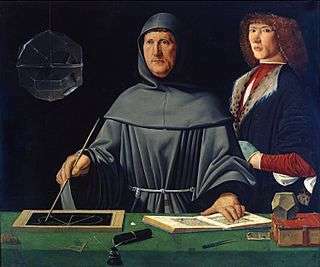 It is also notable for including the first published description of the bookkeeping method that Venetian merchants used during the Italian Renaissance, known as the double-entry accounting system. The system he published included most of the accounting cycle as we know it today. He described the use of journals and ledgers, and warned that a person should not go to sleep at night until the debits equaled the credits. His ledger had accounts for assets (including receivables and inventories), liabilities, capital, income, and expenses — the account categories that are reported on an organization's balance sheet and income statement, respectively. He demonstrated year-end closing entries and proposed that a trial balance be used to prove a balanced ledger. He is widely considered the "Father of Accounting". Additionally, his treatise touches on a wide range of related topics from accounting ethics to cost accounting. He introduced the Rule of 72, using an approximation of 100*ln 2 more than 100 years before Napier and Briggs. The majority of the second volume of Summa de arithmetica, geometria. Proportioni et proportionalita was a slightly rewritten version of one of Piero della Francesca's works. The third volume of Pacioli's De divina proportione was an Italian translation of Piero della Francesca's Latin writings On [the] Five Regular Solids. In neither case, did Pacioli include an attribution to Piero. He was severely criticized for this and accused of plagiarism by sixteenth-century art historian and biographer Giorgio Vasari. R. Emmett Taylor (1889–1956) said that Pacioli may have had nothing to do with the translated volume De divina proportione, and that it may just have been appended to his work. However, no such defence can be presented concerning the inclusion of Piero della Francesca's material in Pacioli's Summa. Pacioli also wrote an unpublished treatise on chess, De ludo scachorum (On the Game of Chess). Long thought to have been lost, a surviving manuscript was rediscovered in 2006, in the 22,000-volume library of Count Guglielmo Coronini. A facsimile edition of the book was published in Pacioli's home town of Sansepolcro in 2008. Based on Leonardo da Vinci's long association with the author and his having illustrated De divina proportione, some scholars speculate that Leonardo either drew the chess problems that appear in the manuscript or at least designed the chess pieces used in the problems. ↑ "THE ENIGMA OF LUCA PACIOLI'S PORTRAIT". RitrattoPacioli. Retrieved 30 January 2015. ↑ Di Teodoro, Francesco Paolo (2014). "PACIOLI, Luca". Dizionario Biografico degli Italiani (in Italian). 80. Treccani. Retrieved 30 January 2015. ↑ "Pacioli biography". www-groups.dcs.st-and.ac.uk. Retrieved 2016-03-24. ↑ McDonald, Lucy (10 April 2007). "And that's renaissance magic ...". The Guardian. Retrieved 30 January 2015. ↑ The Met Store (Metropolitan Museum of Art shopping catalog), "Renaissance 'M' Bookmark" The Museum claims this origin in its descriptions of many souvenir items decorated with this logo, which it calls the "Renaissance M". Bambach, Carmen (2003). "Leonardo, Left-Handed Draftsman and Writer". New York: Metropolitan Museum of Art. Retrieved 2006-09-02.